The chapel of Kilbride (cill Brighde, ‘chapel of [Saint] Brigit’), nestles within a circular enclosure with fairly massive walls. The chapel is oriented east-west. 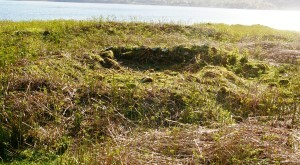 The ruined walls of Kilbride Chapel are nearly obscured by bracken and turf. The enclosure surrounding the chapel may be the remains of an Iron Age fortified settlement or cashel (Gaelic caiseal) that was later adopted by monks or clergy for the enclosure of their early church site. The aerial photo below (copyright Bing Maps) shows the footings of the chapel walls within the cashel. Beyond the cashel to the north-east are the remains of farm buildings and walls belonging to a modern (eighteenth- or nineteenth-century) settlement. They may be associated with the township of Portindrain, now vanished but shown on early maps at NS018976. A well lies 420m to the east called Tobar an Longairt (‘well of the summer grazing’), but it is not known whether it had any connection to the chapel site, nor if it were ever regarded (in spite of its later and secular name) as a holy well. Just off-shore nearby is Kilbride Island, which takes its name from the chapel, as does the farm of Kilbride whose buildings are 1.2km to the south-east. The only sensible way to get here, really, is to walk. From Kilmorie, or from the car park for Old Castle Lachlan, walk down the path to the shore at Lachlan Bay, continue along the coastal path past the castle going north, with Coille Fraoch (‘heather wood’) on your right. The path disappears shortly after you get past the wood, but keep going north about 800m. When you have Kilbride Island on your left, look about you. The chapel is close by, overlooking the island. For a more detailed account of the journey see Routes: Kilmorie to Kilbride. For a good OS Map of Kilbride and the area, click on ‘View Larger Map’ below.